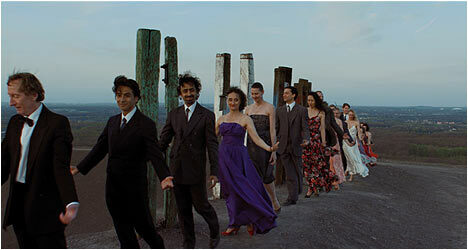 More than 20 years in the making, Pina (2011) was originally conceived by filmmaker Wim Wenders as a documentary about famous choreographer and dancer Pina Bausch. However, he couldn’t figure out how to translate the artistry and elegance of the performers onto film. Wenders wanted to immerse the viewer in the world of dance and when digital 3D technology came along he found a solution. With 3D, he was able to create the illusion of depth. Unfortunately, he faced another challenge when the subject of his film – Bausch – died suddenly in 2009. He reconfigured the film as a tribute to her with excerpts from one of her famous performances – Café Muller (among others) – and danced tributes from members of the Tanz theater Wuppertal Pina Bausch troupe. Wenders uses the medium of film to immerse us in the performances by taking us onto the stage – something that could never be done in real life. This creates a decidedly intimate experience as we get to see the various dancers up close and see the emotions play out on their faces. Wenders mixes his performance footage with archival material that shows Bausch rehearsing with her dancers. He also includes occasional voiceover narration of her talking (along with key collaborators) about the philosophy of dance as she saw it. Pina attempts to take the often distant and detached nature of modern ballet and humanize it by showing how the dances depicted in the film were the personal vision of one woman. Let’s face it; your enjoyment of this film will really depend on how much you like watching dance performances. Regardless, Pina is a fitting and moving tribute to a unique artist. The first disc features an audio commentary by director Wim Wenders. He provides a bit of backstory to Bausch’s impressive achievements. From there, he talks about the origins of the project. It all started many years ago with his then-girlfriend dragging him to a Bausch ballet and his surprising emotional response to it. He also provides technical details on cameras used and how certain shots were achieved. The second disc starts off with “The Making of Pina,” which takes us through the genesis of the project to its filming with Wenders acting as our guide. It juxtaposes footage of Bausch performing with Wenders’ recreation. This is a fascinating look at how it all came together. Also included are 14 deleted scenes with optional commentary by Wenders. It features performances that didn’t make the cut. Wenders puts them into context, provides a brief backstory and explains why they were cut. There are five behind-the-scenes clips with footage that shows the dancers rehearsing juxtaposed with the scene being filmed. Also included is an interview with Wenders where he talks about his first exposure to Bausch’s art and the challenge of trying to bring it to life on film. There is overlap from the other extras and he repeats a lot of the same information.